The DeLonghi DES12 Compact Dehumidifier sits at the bottom of DeLonghi’s DES range and towards the bottom of its refrigerant dehumidifier range, however it certainly doesn’t compromise on the well-known quality of the brand, but the price isn’t particularly low either. This area of the market is dominated by the highly popular EcoAir DC12, so in this review we’ll see whether the DeLonghi DES12 can prove itself as a worth competitor to that model. The control panel on the DES12 is very basic, which could either be a plus or a negative depending on what you prefer. There’s certainly not a lot to go wrong, with just one moveable part – a rotary dial which is turned clockwise through a range of different options. Position the rotary dial in its most clockwise position and the machine is switched off. Move it clockwise from there and you move it through ‘min’, ‘med’ and ‘max’ zones. There’s no indication what humidity these will result in, not even in the manual, so to figure out if you’re getting your desired humidity you could either get one of those very cheap humidity/ temperature meters or judge it by eye with the lack of or presence of condensation. Leaving it set to ‘min’ is pretty pointless as in this setting it will extract very little. I’d suggest that to start with you position it between ‘med’ and ‘max’, as this should land your home within the ‘ideal’ 40% to 60% relative humidity range and take it from there. There is an in build humidistat, so no matter what dehumidifying power you set, the machine will understand the humidity that is being requested and then work toward it. So why can’t DeLonghi publish these inbuilt humidity levels? Possibly because it’s not very accurate. 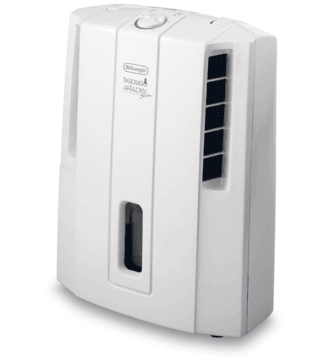 Once the machine senses that the air has reached that particular humidity requested it will stop dehumidifying and switch to fan-only mode until it senses that the humidity has once again risen. There’s a three minute delay for the compressor to turn back on, which is great as it means that it isn’t constantly switching on and off if the humidity is hovering just above the humidity level that has been set. On particularly cold days (less that 5°C) it could be worth turning the machine up to ‘max’ to drop the humidity closer to 40%RH, which is more likely to stop condensation forming. If you turn the dial to its most clockwise position you’ll set the ‘dry’ function. This could be useful for specific situations rather than general usage, such as when drying laundry, while cooking, after a long shower or to dry-out a particularly damp room. When set to this function the machine will dehumidify continuously and will not stop dehumidifying no matter what the humidity of the room is. Driving the humidity lower draws out more moisture from the surroundings so it will help to dry your home faster, however you risk damaging the machine or ‘over-drying’ the air should you leave this setting on continuously for longer than a few days. One of the biggest drawbacks to the DES12 is that it only has one fan speed. This means one fan speed has to cover a variety of scenarios, from drying out a wet room after a shower to non-demanding usage in a well-insulated house. This is a problem because these scenarios demand totally different fan speeds. For the wet room scenario you would like a powerful fan speed to clear the moisture as quickly as possible, however while it conducts less than heavy-duty tasks we would prefer it to be as quiet as possible. Having one fan speed means that it sits between these two requirements, so it is unlikely to clear heavy moisture as quickly as two-speed machines. On the positive side, the water collection bucket is very large for this power of machine at 3 litres, which will result in much greater lengths of time before the ‘tank full’ light illuminates on the control panel versus competing machines and less trips to the nearest drain. It’s accessible from the side of the unit, which is relatively handy and is easy to slot in and take out. There’s a lid to minimise spillages, although no handle, so you have to cup it with two hands like the holy grail as you wander over to the sink. The window into the water tank on the front of the machine is great for judging how full it is without having to open the water collection bucket to peer in. The DES12 comes with what the DeLonghi marketing department have named the ‘Bio Silver Tech System’, which to us mere mortals is a dust filter with an antibacterial coating (silver, in this instance). Silver is widely used amongst manufacturers as a coating on their air filters for its antibacterial properties. Upon contact with the silver coating, bacteria and other nasty airborne particles such as mould should be killed, so we see this as a good addition to the machine. Refrigerant dehumidifiers are not known for their portability, however the DeLonghi DES12 Compact does a great job of bucking that trend. OK, it weighs 9kg, which is as light as refrigerant dehumidifiers get but still a decent weight to lift. To mitigate this, DeLonghi have fitted a very comfortable top-mounted carry handle and four caster wheels, which can be fitted or left off. When fitted, the castor wheels make the unit a breeze to roll around. The thinness of the unit complements the handle to make it easy to carry around. The machine has dimensions of 19cm deep by 37.5cm wide by 48.5cm high. I feel the DES12 is one of the best looking dehumidifiers on the market, which is partly to do with the design and partly to do with the quality of the plastics used. The intake ‘holes’ rather than the grilles that are seen on other dehumidifiers, the thinness and the details on the panels make it look quite modern. From a practicality perspective, the handle, control panel and water collection bucket all feel well-designed. Also, because the unit has a flat back and the air intakes are on the sides of the unit, rather than the back, it can be pushed much tighter against walls than other dehumidifiers, which should be left a 20cm to 40cm gap. This could be a big plus for the machine, depending on where you’re planning to put it. I mentioned earlier how only having one fan speed results in the ‘compromise speed’, which means I’m sure DeLonghi could have made the DES12 quieter with a second, slower speed. 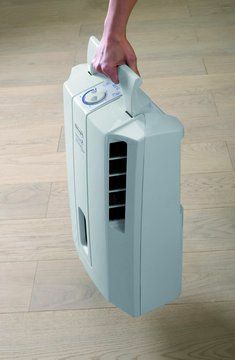 Saying that, DeLonghi tell us that the DES12 produces just 38dB of sound in fan-only mode, which is extremely quiet for a refrigerant dehumidifier. With the compressor switched on when it’s dehumidifying the noise level does jump. It would be fine sitting in a hall (an ideal place to site any dehumidifier), but you probably wouldn’t want this in a bedroom or where you watch television, as it may disturb you. As the name suggest, it’s rated to extract up to 12 litres per day, however you shouldn’t be expecting to empty the water bucket four times per day. 12L is what you can expect the DES12 to extract every day at 80%RH and 32°C, conditions that obviously are rarely experienced in UK homes. Under standard UK room temperature and conditions you can expect to empty the water collection bucket once per day and probably less than this once the machine has ‘bedded in’, depending on various aspects of your home. The machine comes with an anti-frost setting, similar to that you’ll find on other refrigerant dehumidifiers, which will switch on with increasing frequency as the temperature drops lower. As long as your home stays above 15°C (including overnight) then this isn’t anything to worry about. The DES12 should have enough power for homes up to about three bedrooms in size. To summarise the above review, if you want a refrigerant dehumidifier for a home that is three bedrooms or less and don’t need an array of different modes and functions, the Delonghi DES12 could be a great choice at the right price. Be careful not to overpay, we found the best deal at this store, so I suggest that you give that a look.